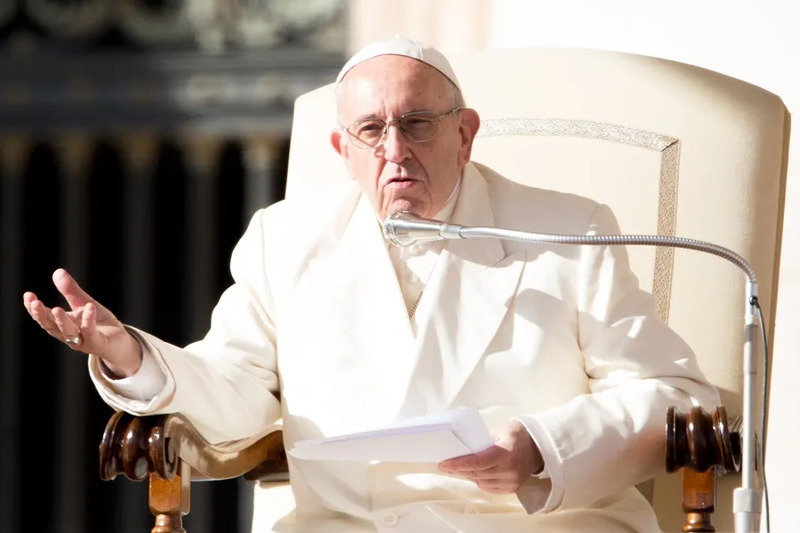 Vatican City, Nov 12, 2017 / 05:36 am (CNA/EWTN News).- On Sunday Pope Francis encouraged people not to wait to reflect on their lives, but to ask themselves: If this was my last day on earth, am I prepared? Am I cooperating with God’s grace? 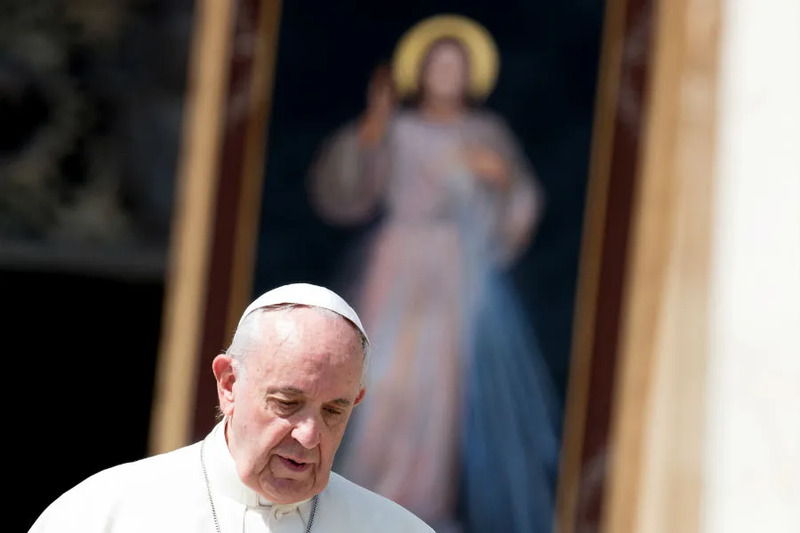 The basis of the Pope’s Angelus reflection on preparing for the Kingdom of Heaven was the day’s Gospel passage of the parable of the ten virgins: five wise and five foolish. In the parable, which he said, “tells us the condition to enter the Kingdom of Heaven,” we hear the story of five virgins who are wise and prudent, bringing oil for their lamps while they wait for the bridegroom. The other five, however, are foolish and are not prepared with oil. Therefore, when the arrival of the bridegroom is announced the five foolish virgins realize, too late, that they are not prepared. Thus, the wise virgins enter into the banquet hall with the bridegroom and the door is closed on the foolish. 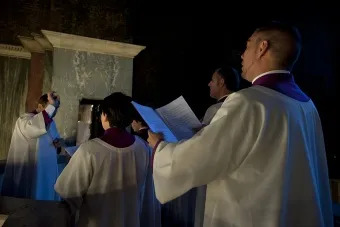 “If, however, we are vigilant and try to do good, with gestures of love, sharing, service to our neighbor in difficulty, we can remain calm while we wait for the bridegroom’s coming,” he reassured. Following the Angelus, Pope Francis spoke about Vicente Queralt Lloret and 20 companions and José María Fernández Sánchez and 38 companions, who were beatified in Madrid on Nov. 11. Some were members of the Congregation of the Mission: priests, brothers and novices, he said. 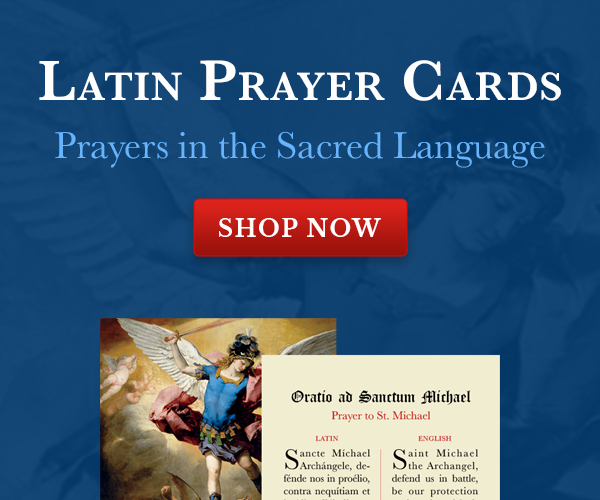 And others were laity who belonged to the Miraculous Medal Association. They were all martyred during the religious persecution of the Spanish Civil War between 1936 and 1937. “We give thanks to God for the great gift of these exemplary witnesses of Christ and the Gospel,” he said. Francis then concluded by greeting different pilgrim groups, including groups from Washington, Philadelphia, Brooklyn and New York. When he did, a group broke out in song for a moment, which the Pope paused to listen to. He then thanked them for the song before asking for prayers and wishing everyone a good lunch. Vatican City, Mar 9, 2018 / 01:58 pm (CNA/EWTN News).- A March 8-11 “hacking marathon” at the Vatican is in full swing, with 120 students of different backgrounds, faiths, and disciplines working to “hack” into global social problems in 36 hours of innovative brainstorming. “VHacks” is the first-ever Vatican hackathon, and the young participants and organizers have said that the location is an integral part of the event’s impact and appeal. Hailing from 60 different countries, participants work in teams to tackle challenges related to the broader themes of social inclusion, interfaith dialogue, and refugees and migrants. Each team chooses a challenge to “hack” during the conference, working nearly round-the-clock to come up with creative, technological solutions. At the end, all the teams will present their solutions to judges who choose the top projects and the final winners. Ibrahim, 21, is from Pakistan and is studying industrial engineering and management at Jacobs University in Bremen, Germany. A Muslim, he considers the Vatican a “landmark,” and a “sacred place,” which adds to the overall environment of the hackathon. “I think this is an extremely amazing initiative,” he said. Hailing from Buenos Aires in Argentina, Sebastian, 24, told CNA that he has participated in hackathons before, but this one is “on another scale,” and that’s what first piqued his interest. Lucy, 29, told CNA that she is really excited by “how invested this hackathon is in the human perspective and understanding what the user’s needs are.” She is a master’s student studying human-centered design thinking at Georgetown University. Her team members, who all came from Georgetown, a partner in the event, chose the migrants and refugees challenge. “When you think about refugees in the big scope, it seems like there’s no point of entry that’s going to succeed,” she said. “So how do we as individuals or as groups find an entry into that? I really think it is through this human-centered design” that VHacks is focused on. The hackathon is also interspersed with educational opportunities, including panels and workshops on topics related to the themes. Participants can also avail themselves of advice and guidance from experienced “mentors” present to help throughout the conference. “It’s not just a hackathon but a learning experience and a team-building experience,” Lucy said. The event will conclude with Mass and sightseeing in St. Peter’s Basilica March 11, followed by attendance at the Pope’s Sunday Angelus and his papal blessing in St. Peter’s Square. Dominican Fr. 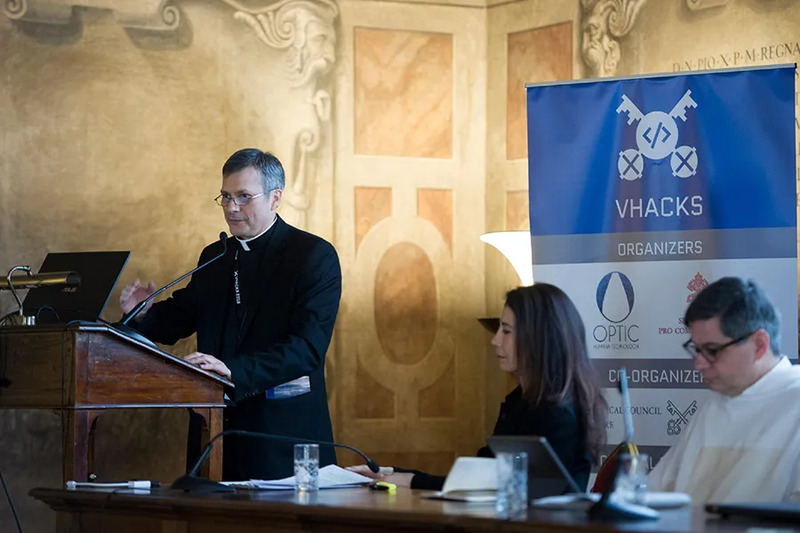 Eric Salobir, a co-chairman of VHacks and a consultor for the Secretariat of Communications, told CNA that having the hackathon at the Vatican is very symbolic, and allows big issues to be tackled from the global perspective offered by the Church. Salobir is also the founder of the OPTIC network, a disruptive technology think-tank which frequently collaborates with the Holy See. He acknowledged that it is unrealistic to think that solutions to these problems can possibly be found in just 24 or 36 hours. But what they want to do is “plant a seed” and create something to expand on in the future. The environment of the hackathon, which lacks the usual pressures found in a career setting, makes it really “conducive to innovation,” he stated. In the end, it is hoped that some of the new ideas produced will be brought to fruition by the corporations, foundations and private donors sponsoring the hackathon. A lofty goal, Salobir said they even hope to have some examples “of how technology can help to solve problems” in place by the time of the synod on the youth in October. “We hope to be able to show very practical, useful solutions,” he said.